From the tech-thrash of 2011’s Chaos Of Forms, through the more progressive stylings of 2013’s self-titled record and on to the more straightforward death/thrash hybrid of 2014’s ironically-titled Deathless; Revocation have always been a band to prod and challenge the comfortable little death-thrash niche they’ve carved out for themselves. Great Is Our Sin is no different—if not leaving behind, then certainly shifting aside the tech/prog/traditional death metal tinge of their previous releases in favor of a distinctly melodic death metal-influenced approach. Great is the sin of the album title’s lack of contrast, amirite?! 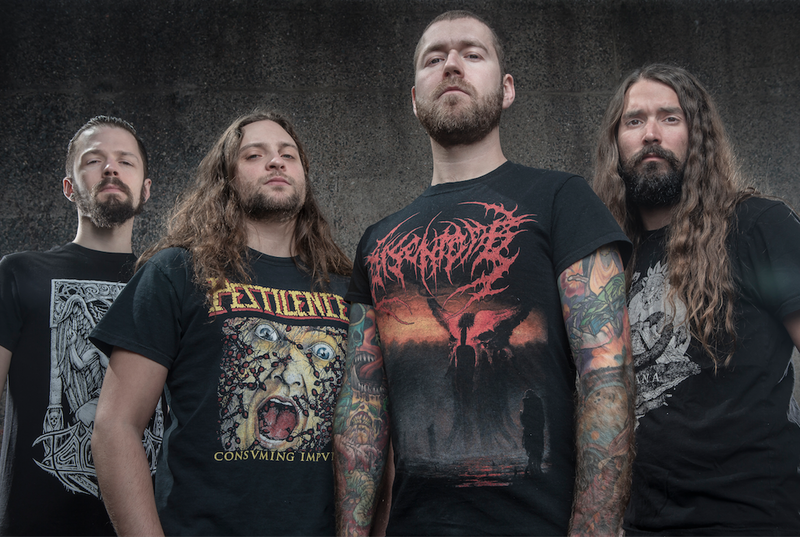 Revocation’s trademark blend of death and thrash metal reaches new heights with Great Is Our Sin. Blistering opener, “Arbiters Of The Apocalypse” sounds like Annihilator playing mid period In Flames material, and it’s both an interesting and successful take on the death-thrash sound that the band are reluctant to let go of throughout the rest of the record, and for good reason. Along with the added melodic emphasis, there’s also a greater degree of progressive death metal elements in play, which—though not quite as obvious as Revocation’s abrupt banjo break—remain in constant, yet subtle, play throughout the record. “Profanum Vulgaris” brings to mind Morbid Angel at their most dissonant, along with the loftier moments of Death’s later output, in equal measure; while “Crumbling Imperium” and “Monolithic Ignorance” are the kind of tracks you wish Gojira were still making these days, with ex-3 Inches Of Blood drummer Ash Pearson playing perhaps a more-subdued, though no less proficient role than his predecessor, and “The Exaltation” draws heavily from Sepultura’s more-destructive moments. Something truly unique to Great Is Our Sin—in terms of Revocation’s discography—is its refusal to ever grow dull or off-putting. As objectively impressive as efforts such as Chaos Of Forms and Revocation were, their explosive moments are largely undone by a tendency to overwhelm the listener with their fast-paced, impressive technicality, to the point where getting through the album(s) in one sitting—as enjoyable as their material inherently is—becomes quite the chore. Great Is Our Sin is similarly single-minded, but there’s enough texture and layering within its eleven exhaustive tracks to maintain interest and give the listener a welcome reprieve from all the brutality when necessary; so that the record actually builds to such devastating outings as “Only The Spineless Survive”—which is similarly followed by the more subdued and melodically-inclined “Cleaving Giants Of Ice”—rather than continually ramming them down the listener’s throat. It could be argued that Great Is Our Sin is Revocation’s best outing to date, and this is certainly an argument I’d be willing to make, but the same could be said of any of their releases really—given the consistency and surprising variation they’ve delivered over their remarkably short and relatively prolific career. However, what is surely certain is that this sixth album represents the best collection of songs the band have put together to date, and there’s no denying that it’s their most consistent. 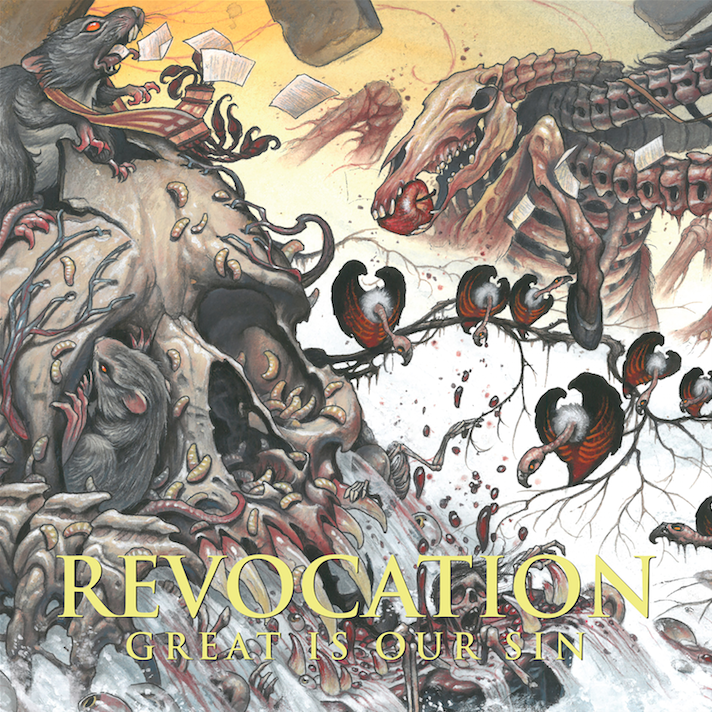 Much like In Flames’ Colony (1999)—which it so readily brings to mind—Great Is Our Sin shares that rare distinction of possibly being both Revocation’s best and most developed record, along with undeniably being its most accessible. This entry was posted in Death Metal, Featured Review, Reviews, Thrash Metal and tagged Death Metal, featured, Great Is Our Sin, metal blade, Revocation, technical, Thrash Metal.